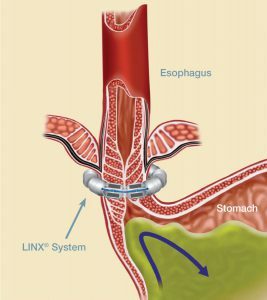 We are now offering a new treatment for chronic reflux disease (also known as GORD or GERD) using the Linx® system. GORD affects at least 10% of people. It is a chronic, often progressive condition, which results from a weak lower oesophageal sphincter (LOS) allowing acid and bile to flow back or ‘reflux’ from the stomach into the oesophagus. The most common symptom is heartburn. However if left untreated it can lead to more serious conditions such as Barrett’s oesophagus or oesophageal cancer. 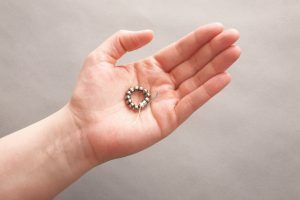 The Linx® system is a small, flexible band of interlinked titanium beads with magnetic cores. It is placed around the oesophagus just above the stomach using a minimally invasive surgical technique called laparoscopy or keyhole surgery. The magnets create a barrier to the reflux of acid and bile, whilst still allowing swallowing. The procedure is generally completed in less than an hour and the side effects are minimal and resolve over time. The Linx® procedure is performed at Parkside Hospital by Mr Marcus Reddy. If you would like more information please click here.